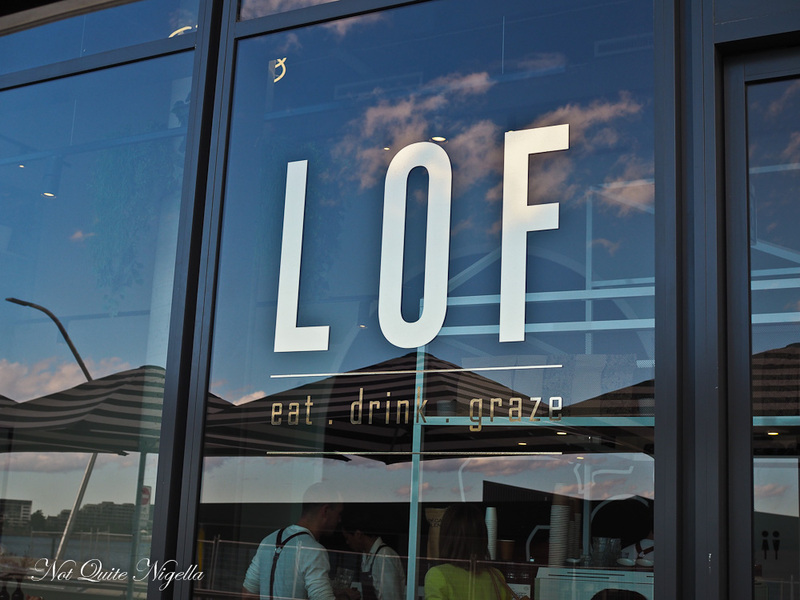 Left of Field is a cafe in the suburb of Rhodes near Homebush. 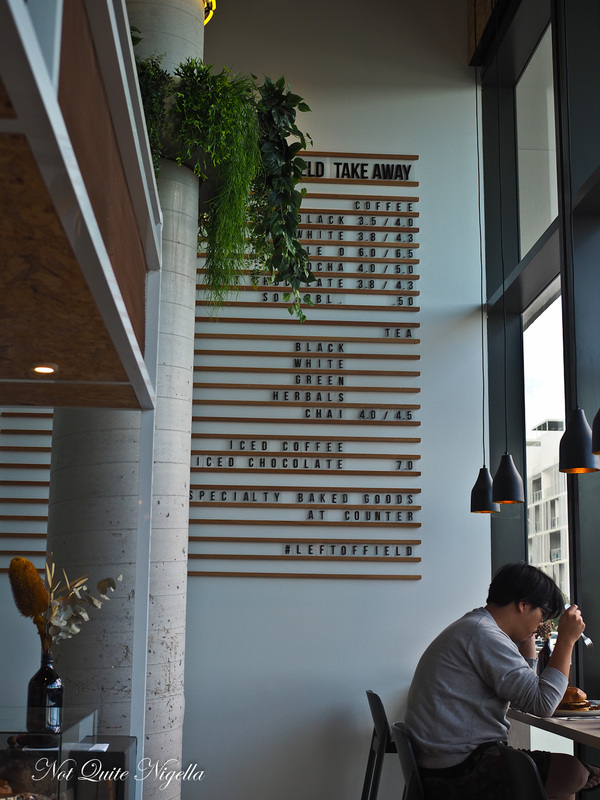 Popular on Instagram, the cafe is filled with natural light and has photogenic dishes. 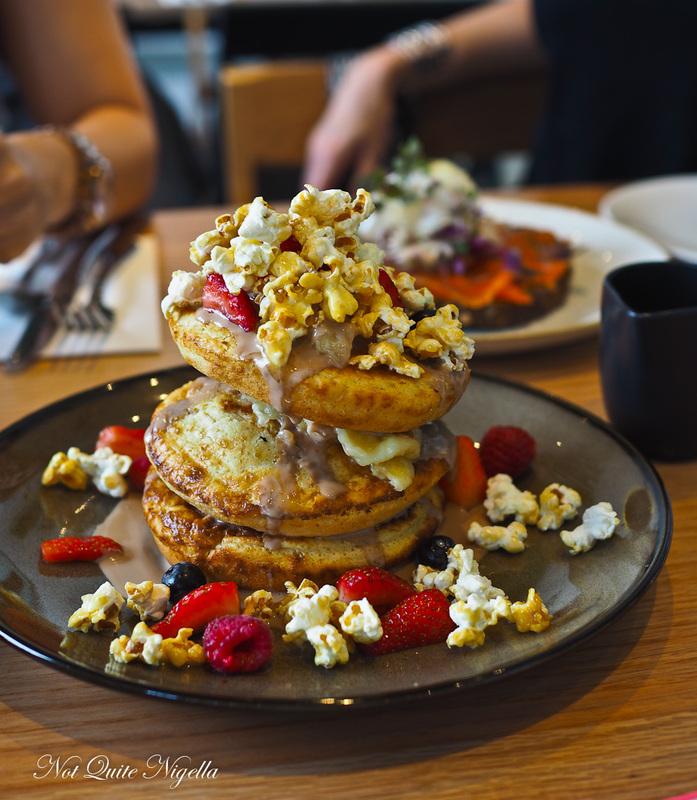 People flock there for a photo of the enormous stack of hot cakes with Earl Grey custard and popcorn or other brunch items. It's Monday at 11:30am in Rhodes. A car drives around and round and round, circling the block hoping for a park. It's a sight I see my friends repeat over and over again and it's something I have just finished doing. For a newly developed suburb Rhodes doesn't have a lot of parking options. I'm just glad that we didn't try it on the weekend. Local Belinda lives nearby and a couple of weeks ago she had visited Left of Field. It's mid construction and busy (and we wonder are there plans for a public car park soon?). Belinda has invited a crowd so that we can try more of the menu and we each pick one thing. 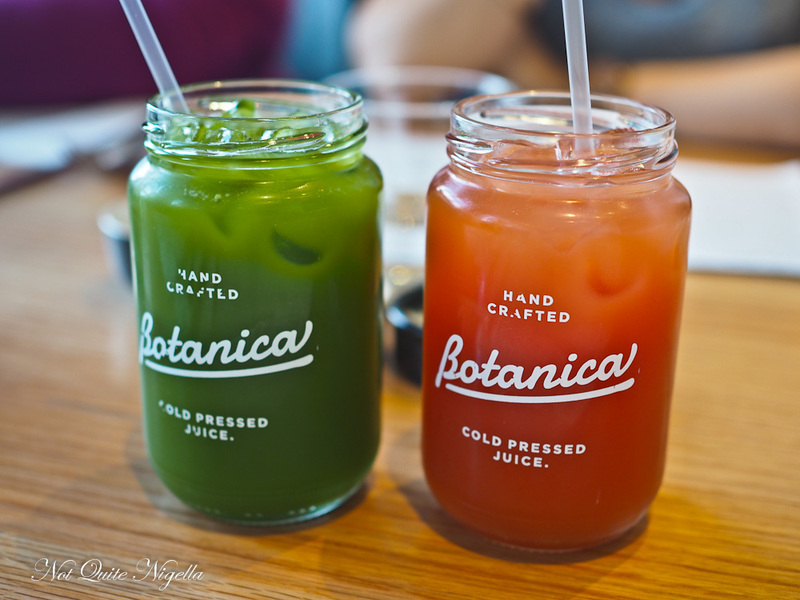 I start with a Botanicals drink with kale, celery, apple and lemon. It's on the right side of sweet and isn't too green. 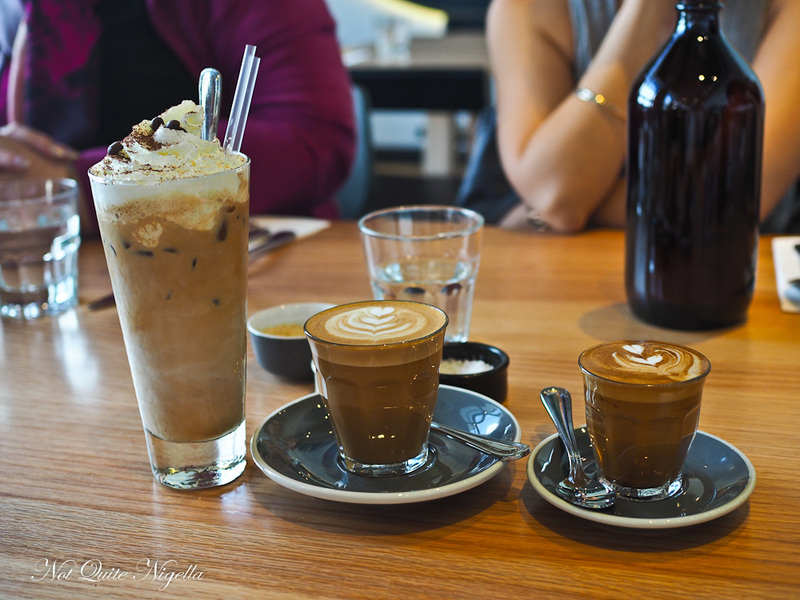 Cheryl orders a watermelon juice while Belinda, Alyson and Jenny order coffees. Service is very friendly and accommodating. The smokey baked beans are Cheryl's choice. 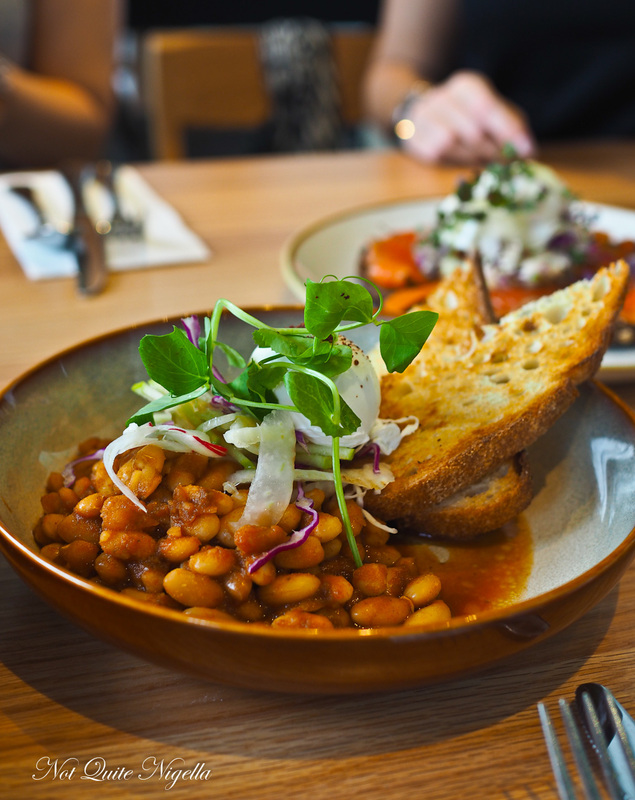 They do need a bit of seasoning and they come with a runny centered poached egg, two pieces of toasted sourdough and a salad of apple, fennel and radish. The salad textures are crunchy compared to the soft beans and it's not a bad dish once salt is added. This is the favourite item for everyone. 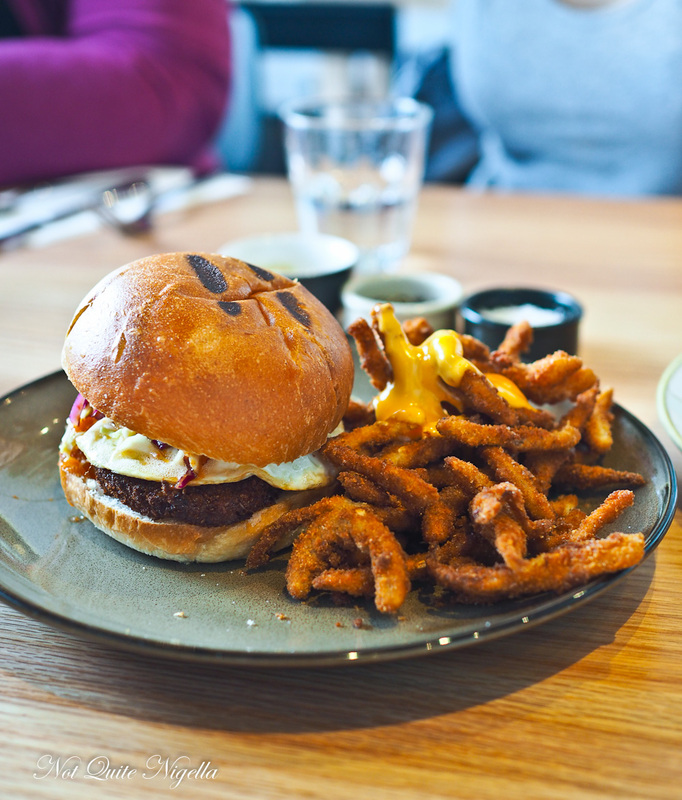 It is a pork burger with a pig cheek schnitzel kimchi slaw, fried egg and mayonnaise served with a generous side of crumbed pig ears fries. When we ordered it our waiter had to check if we wanted the pig ears fries little knowing that this was Belinda's favourite thing off the menu. It just needs a little sauce extra to dip the fries in. Jenny's order of the steamed trevalla is an option if you're looking for something healthy. 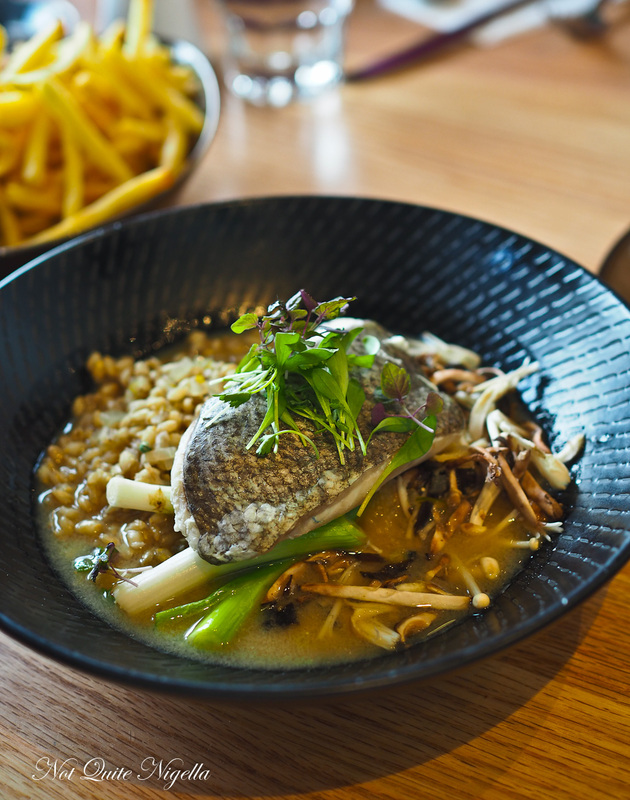 Mildly flavoured, the fish is cooked well and is served on a bed of pearl barley with enoki mushrooms and shallots with a miso ginger broth. 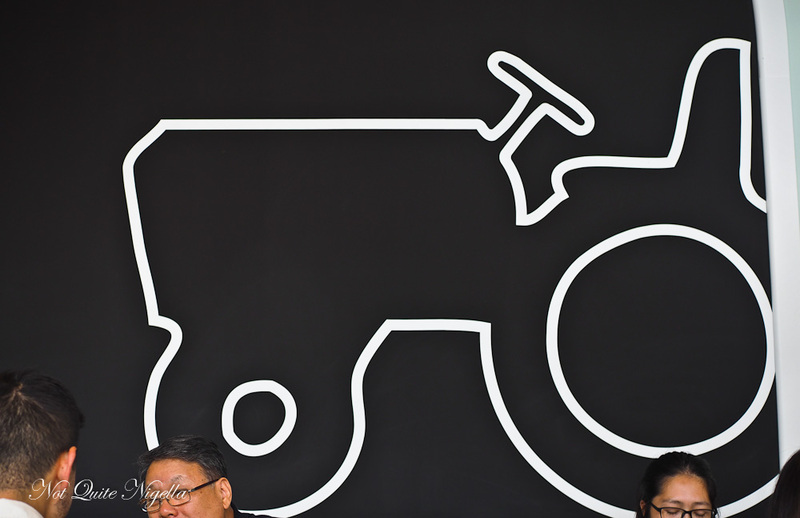 It's like the opposite concept to the big, bold pork burger and is all very gently gently. But you have to be in the mood for this. 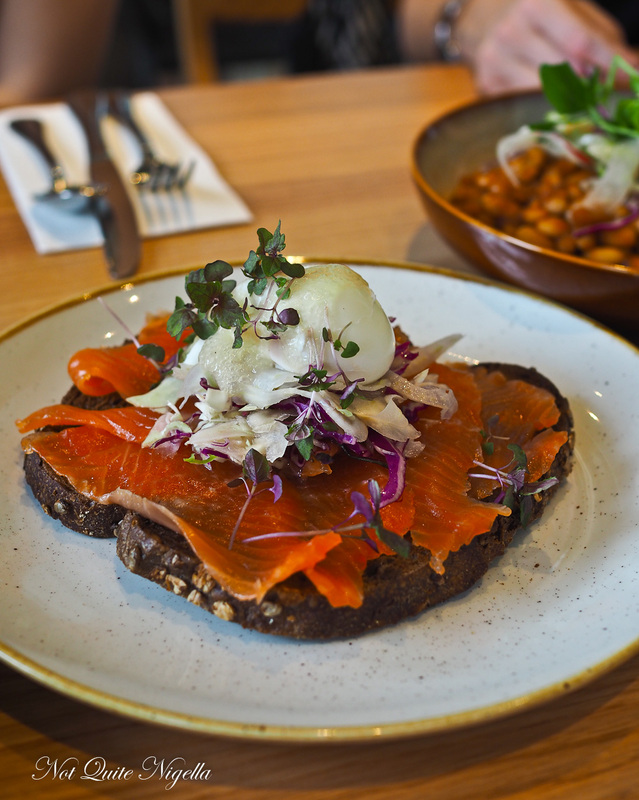 Alyson's choice is the juniper cured ocean trout fanned out across a slice of grilled dark rye bread. On top is a poached egg, fennel salad and yuzu foam. We would have loved it if the yolk was runny which would have given it a creaminess but when you add some of the comeback sauce from the fries it really brings it all together. 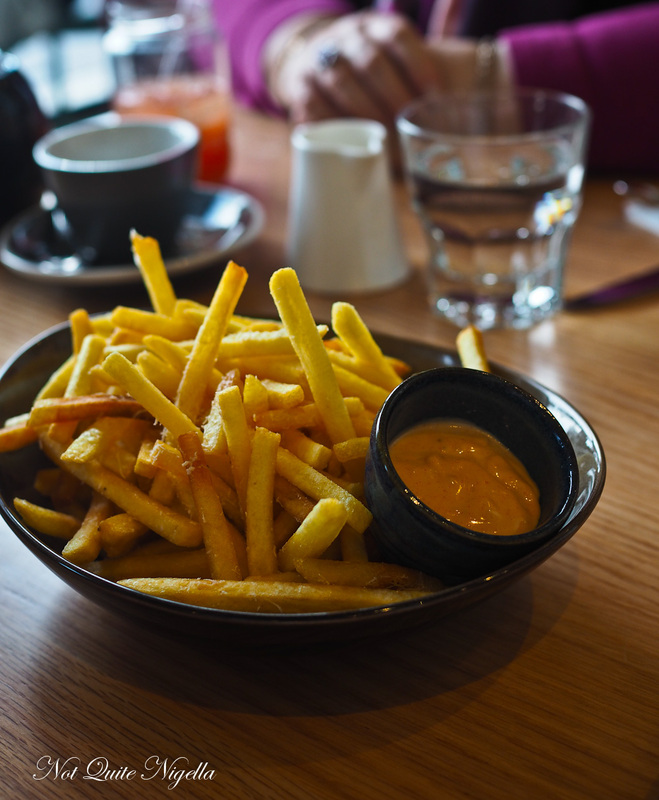 Speaking of the comeback sauce, the fries which are crispy and golden and come with a comeback sauce which is an onion flavoured mayonnaise based dressing that is very hard to say no to. We opted for an add on of pecorino and truffle oil and both are very light. It needed more pecorino and truffle (and more comeback sauce, I would have bought a bottle if I could!). Last but not least come the hot cakes which are my order. They come as three hot cakes topped with maple popcorn, strawberry slices and an Earl Grey custard with a little jug of custard on the side. They're massive - I don't think a single person could finish this unless they were ravenous. They're puffy and light but very thick and I don't really get the popcorn on top. Visually it's impressive and the presentation of the food probably accounts for the cafe's and this dish's popularity on Instagram but once the popcorn hits the custard it turns soft. So tell me Dear Reader, would you eat pig ear fries? Do you go to places based on pictures you see on social media? And is easy parking a big thing for you?